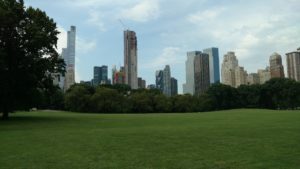 The day after I went to the Grolier Club, The Frick, and The Morgan, Ed and I visited The Metropolitan Museum of Art. This time, for a change, we took a tour of the highlights of the museum. It was interesting enough, but afterwards we wandered, and some things particularly caught my eye. 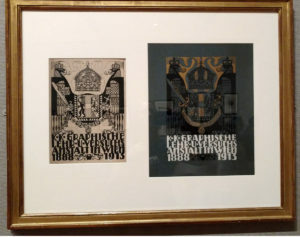 Gallery 690 displays a rotating selection of The Met’s prints and drawings. We made it a point to visit this gallery to enjoy the etchings by Rembrandt and Castiglione that were on view. The costume studies by Leon Bakst were also incredible. I was interested to see examples of the graphic design of Erwin Puchinger, an Austrian who designed for Viennese newpapers and periodicals at the beginning of the 20th century. 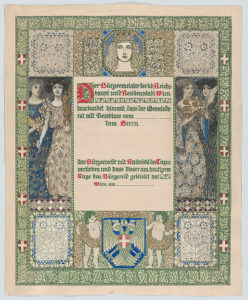 According to the information provided by The Met, this design for a certificate of Viennese citizenship shows his early exposure to the English book illustrations of the Arts and Crafts movement, its four allegorical figures are reminiscent of Pre-Raphaelite, and the decorative borders show Moorish influences. This framed piece shows the black-and-white design of a book cover with notes indicating color and adjustments, as well as the 3-color-printed piece on blue cloth. Puchinger was chair of the manual graphics design department of the Viennese Graphic Design School and this was 1913 publication honored the school’s 25th anniversary. You can see images of everything on display in Gallery 690 here. Take a look at Leon Bakst’s illustrations! I’ll start with the last – no, the penultimate – place we’ve been: New York City. While husband and son were at a Yankees game, I visited some of my favorite place to see art in the city. From the Upper West Side, I walked across Central Park to get to the Grolier Club on 60th. It was a beautiful way to start the day. I was to log 20,000+ steps visiting seeing art that day. 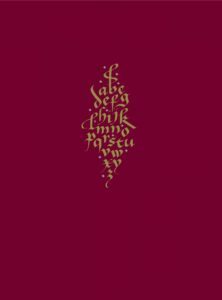 The highlight: “The Calligraphy Revival – 1906-2016” on exhibit at the Grolier Club. Wow! 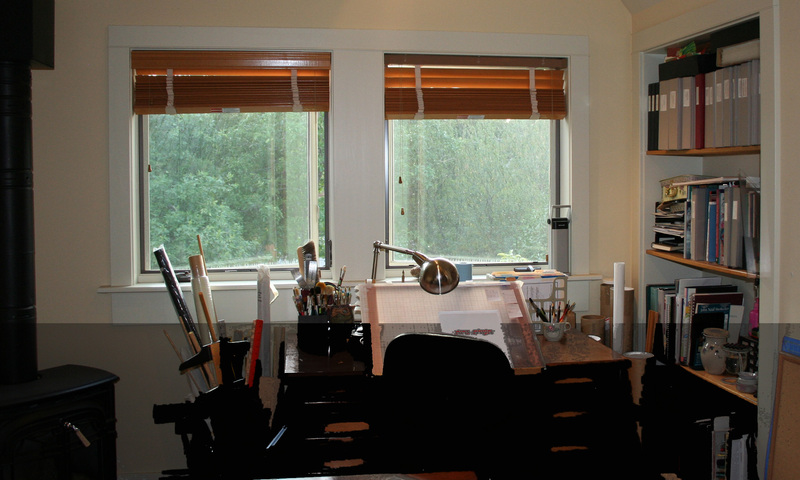 One room, nearly every major calligrapher beginning with Edward Johnston, one piece per calligrapher, nearly all of the artwork from the the collection of Jerry Kelly, the curator. Wow! I’m getting the catalog, which is available from John Neal Bookseller and Oak Knoll Books. At $45, it’s not cheap, but … wow! There are pieces you won’t see anywhere else. 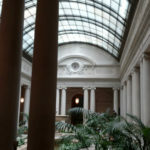 Then I walked up Park Avenue to The Frick, where I discovered that The Frick, The Morgan, and Neue Galerie have now collaborated to offer the Connoisseur Pass, which gives you admission to all three places for roughly the price of two. (I didn’t make it to the Neue Galerie this time, but the pass saved me $2 anyway.) I promptly sat down in the lovely courtyard for a rest. Like The Morgan and Neue Galerie, this building was originally a private home and the owner’s collection formed the basis for the museum’s holdings. I had planned to walk on up to the Met, but I thought I might be able to persuade my husband to visit there the next day. (I was right.) So instead I took the subway down to The Morgan, perhaps my favorite place to see art. Their exhibits are always to interesting to us manuscript people, and it’s not overwhelming. The most interesting thing I saw there that day: drawing of “Poussin, Claude, and French Drawing in the Classical Age“. The images of the exhibit at The Morgan website can’t begin to do them justice. It was a lovely day in New York City.